The 2017 NFL Fantasy Football season is here and DFS players will once again be hitting the two biggest daily fantasy football sites FanDuel and our affiliate partenr DraftKings to play for millions of dollars in cash prizes! Every week one of the biggest choices to make is who will be the fantasy quarterback that you will want to anchor your lineup with. Some fantasy players will focus on the top tier QB’s and some will go for middle tier QB’s and pair them up (stack) with a Top Wide Receiver. Regardless, the list below are the Top 5 Fantasy QB’s that each week in the 2017 NFL season will be a top tier choice for your fantasy football lineup. All 5 will probably be the most expensive QB’s at either FanDuel or DraftKings but will nonetheless be guys to consider. We also have added 5 more quarterbacks that we like to be lower cost options that you should take a hard look at week to week based on matchups. If you have been living under a rock and haven’t played Daily Fantasy Football and have been busy playing your buddies in a season long league then it’s time to try out DFS Football. FanDuel.com offers millions of dollars in their annual World Fantasy Football Championship (WFFC) which gave out $5 Million in prizes last year. Expect 2017 to make millionaires once again. If you join FanDuel you will get a Free Contest ticket into their NFL Sunday Million Contest to play for $1 Million in cash prizes. DraftKings.com runs their DraftKings Fantasy Football World Championship and last year gave away $10 Million in cash prizes and $2 Million to the 1st place winner! You want a shot at that kind of money? Join using our affiliate partner links (you don’t need a DraftKings Promo Code) and you will get a bonus game ticket when you make your first deposit that can qualify you to get a seat to be playing for the BIGGEST Fantasy Football prize money in 2017! There are tons of guys that can catch the ball for Rodgers and their offense is built for throwing the ball. Will probably put up similar numbers to last year. No doubt Brady is in the top tier of the QB ranks. He probably could be ranked higher each year if it weren’t for Bill Belichick and his game plans that sometimes take the ball out of his hands altogether. Brees is in a contract year and would like one last payday. The Saints offense will continue to be a throw first offense under Sean Payton. Not sure why so many were surprised at Ryan’s number last year. Aside from throwing more TD’s he has always thrown for tons of yards. Admittedly having Julio Jones to throw to can make you look really good. Might be higher on this list if his health wasn’t a concern. The Colts may have to try to outscore everyone this year which means a healthy Luck is a weekly cash printing press. He throws too many INT’s but he will keep getting better and the Bucs offensive is going to still feature throwing the ball downfield a lot. Carr was one of my Go-To quarterback picks all year at DraftKings and it paid off pretty well. Probably has the weakest set of receivers to throw to (not including TE Jimmy Graham). If Wilson gets back to running the ball again he is a weekly steal at FanDuel. He has 2 top WR and a PPR running back that caught 75 balls out of the backfield (in only 12 games). If Ben can stay healthy and upright he is a solid pick each week. Once again playing for a long term deal but his numbers keep getting better. He’s got new and better receivers in 2017. You can't win if you don't play! 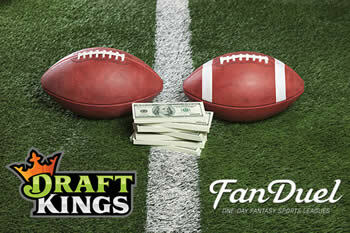 Join the two biggest sites for daily fantasy football and play for MILLIONS of dollars each week! Join FanDuel.com Take advantage of their Free Contest Ticket Promo and play for MILLIONS OF DOLLARS weekly! Join DraftKings.com and get a FREE Ticket Bonus entry into a paid fantasy football contest with your 1st deposit of $10 or more! No DraftKings Promo Code required, just click the link! What Is Daily Fantasy Football? Where Can I Play Free Fantasy Football? Why Are You Still Playing ESPN Fantasy Football? What Are The Best Fantasy Football Leagues To Play? Copyright © 2017 Play Daily Fantasy Football (www.playdailyfantasyfootball.com) - All Rights Reserved.